Wood, an ecological, economical and effective heating resource. 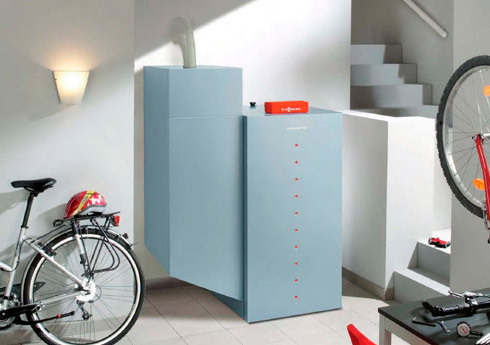 The wood pellet boiler is automatically supplied with wood pellets ensuring autonomy of approximately 1 year with a full silo, and it diffuses clean and even heat through hot water circulating in the radiators or floor heating of your house. The wood pellet boiler is highly ecological, and benefits from a tax credit that can go up to 30% of the value of your boiler! The wood pellet boiler relies on the same principle as the gas or oil boiler, in other words, on combustion and diffusion of heat by water. Wood pellet combustion is used to heat the water that is then distributed to your radiators or floor heating. The wood pellet boiler can also be used to supply you with sanitary hot water. A specific device connects the boiler to a storage tank containing the pellets, allowing an entirely automatic supply of pellets to your boiler. The wood pellet boiler and its hot water tank are installed in your house in a well aired room to remove residues of possible fumes and keep the tank in an environment protected from the cold. Installing a wood pellet boiler also requires installation of a pellet sile nearby that will automatically supply the boiler. Using a professional to install a wood pellet boiler allows you to benefit from government aid provided for this. The wood pellet boiler should be inspected by a professional at least once a year to ensure the safety of the installation. The pipe for water fumes must have soot blowing at least twice a year, particularly during the period of use (winter). A maintenance plan can be suggested to you by Clim Var Froid, who will take pains to remind you that the maintenance period for your installation is coming.